Wonderful! I did not want to put this book down. I loved the comedy and the romance in this historical fiction. It would be hard to go from working in a prestigious Boston auction house to an auction barn. Miranda had to do this to help her family find a painting that they sold inadvertently by her grandfather. This book had many happy points and some sad points. Miranda and Wyatt were great characters that belong together. I received this book from the author and bookfun.org for a fair and honest opinion. 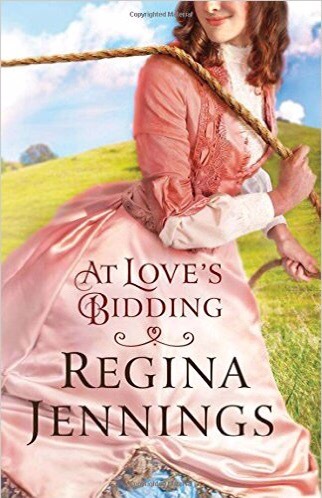 Regina Jennings Is a Rising Voice in Humorous Historical Romance After helping her grandfather at their Boston auction house, Miranda Wimplegate discovers she’s accidentally sold a powerful family’s prized portrait to an anonymous bidder. Desperate to appease the furious family, her grandfather tracks it to the Missouri Ozarks and makes an outlandish offer to buy the local auction house if they promise not to sell anything until he arrives. Upon their arrival, however, they discover their new business doesn’t deal in fine antiques, but in livestock. And its manager, ruggedly handsome Wyatt Ballentine, is frustrated to discover his fussy new bosses don’t know a thing about the business he’s single-handedly kept afloat. Faced with more cattle than they can count–but no mysterious painting–Miranda and Wyatt form an unlikely but charged partnership to try and salvage a bad situation getting worse. This was an ok story. I enjoyed the other books in this series a lot more. I had a hard time liking Lacey Rose or Charlie Nightingale. Neither one seemed to really want to grow up and face the bad choices that they were making. The story seemed ok but sometimes was a little choppy. I like Caryl Mcadoos writing but this story wasn’t my favorite. I do hope to read the next installment of this series to see if they grow up any. I received this from Celebratlit for a fair and honest opinion. I gave this a four out of five stars. This is a good mix of Amish and Englishers. Joel has returned from Iraq injured. Shani wants a fresh start and moves to her grandparents old home in Lancaster county. Their friend Charlie comes to help Shani and Joel get settled and he meets Eve Lehman, an Amish woman. Can they all be friends or can Amish and Englishers not stay friends. There are a lot of twists and turns in this story. I really loved all the characters and how they are woven together. I received a copy of this book from Bethany House for a fair and honest opinion. Journey Down a Quiet Lane in Lancaster County Where Love and Heartache and Friendship and Healing Meet When Joel and Shani Beck arrive at their new home, they’re looking for peace. Shani is thrilled to have Joel back from Iraq, but he needs time to heal, and the quiet of Lancaster seems just the place. They can’t imagine any trouble with their Amish neighbors, the Lehmans, but things get off to a rocky start when their son is involved in an accident that injures one of the Lehman boys. Eve Lehman has run her brother’s household ever since the death of his wife, but Tim’s a stern patriarch. Despite his protests, she’s drawn to the new neighbor, Shani, and the two begin to form a strong friendship forged on faith and family. Things seem like they’ve quieted down until Joel’s single and handsome army friend Charlie catches Eve’s attention–a man unlike any Eve has ever met. Suddenly life for both families becomes more complicated than any of them could have ever imagined. This book kept me interested from start to finish. I loved all the characters in the story. There were a lot of twists and turns throughout. Louisa Borden meets her fate after being thrown from a horse. Jackson O’Neil helps her and she is a snob to him. Many adventures later and some tragedies help to bring them together again. This is a long book but it never seemed that way to me. I had to know how all the characters would fair in the end. 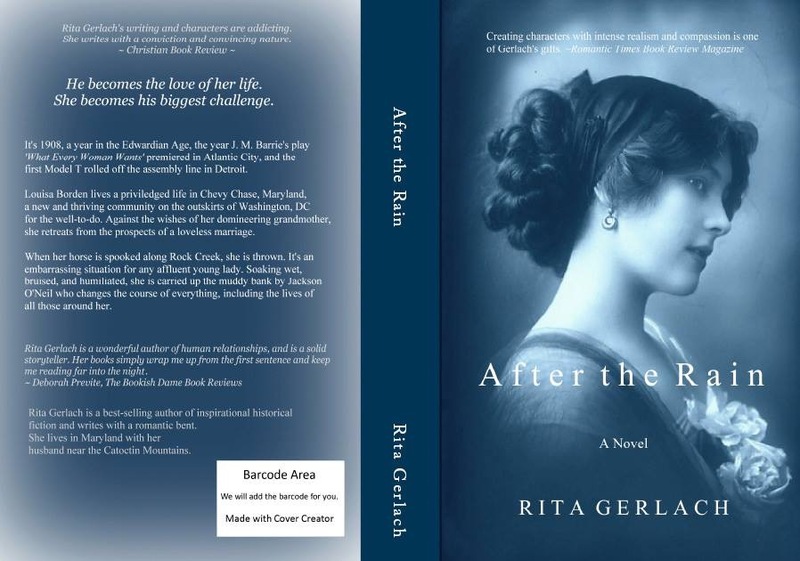 I look forward to reading more of Rita Gerlachs books. I received a copy of this book from Celebratelit for a fair and honest opinion. He becomes the love of her life. She becomes his biggest challenge. 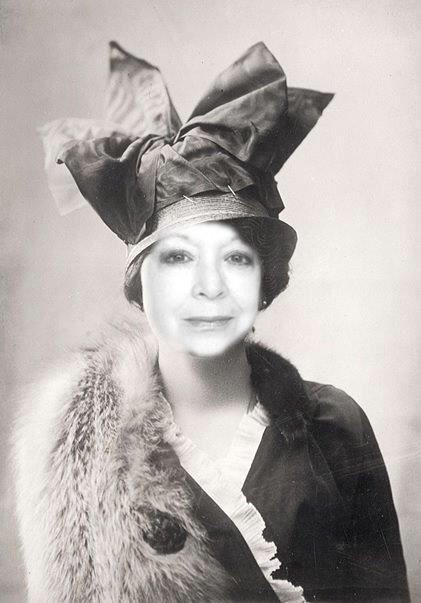 It’s 1908, a year in the Edwardian Age, the year J.M. Barrie’s play What Every Woman Knows, premiered in Atlantic City and the first Model T rolled off the assembly line in Detroit. It is a year when the world faced one of its worst disasters in history, when the New Year would heal the wounds of loss. Louisa Borden lives a privileged life in Chevy Chase, Maryland, a new and thriving community on the outskirts of Washington, DC for the well-to-do. Against the wishes of her domineering grandmother, she retreats from the prospects of a loveless marriage and instead searches for what she hopes is her calling in life. This is a book of 4 wonderful Christmas novellas. These are all Amish stories that are connected by a single night in December. The main characters of each story were born on December 1 in an Amush birthing clinic in the town of North Star.I loved every story and they were all wonderful. The four stories are Guiding Star by Katie Ganshert, Mourning Star by Amanda Flower, In the Stars by Cindy Woodsmall and Star of Grace by Mindy Starns Clark and Emily Clark. I did not want to put any of the stories down. This is such an uplifting set of Christmas novellas. I received this book from Bloggingforbooks for a fair and honest opinion. One night four lives entered the world by the hands of an Amish midwife, just outside North Star, Pennsylvania. Rebekah s Babies, as they are called, are now grown adults and in four heartwarming novellas each young person experiences a journey of discovery, a possibility of love, and the wonder of Christmas. “Guiding Star” by Katie Ganshert Curiosity gets the best of Englischer Chase Wellington when he investigates the twenty-five-year-old disappearance of an Amish baby. When he finds adventurous Elle McAllister in Iowa will his discoveries upend her world? “Mourning Star” by Amanda Flower Eden Hochstetler slips from her parents fudge shop to investigate the death of her friend Isaac. Who is guilty? Isaac s handsome great nephew Jesse, an angry Englischer, or someone else? “In the Stars” by Cindy WoodsmallHeartbroken Kore Detweiler avoids North Star after Savilla Beiler rejects his love. But when he is unexpectedly called to return home, he and Savilla must join forces to keep a family together. “Star of Grace” by Mindy Starns Clark and Emily Clark Andy Danner left North Star to join a new Amish settlement in Mississippi. 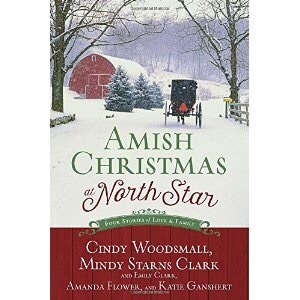 His little brother devises a scheme to bring Andy home for Christmas and unwittingly unleashes the power of forgiveness in a reclusive widower s life.”CINDY WOODSMALL is a best-selling author of several works of Amish fiction and a non-fiction book. MINDY STARNS CLARK is a bestselling author of both fiction and nonfiction, coauthoring the Christy Award-winning The Amish Midwife. Her daughter EMILY CLARK is an MFA student. AMANDA FLOWER authored the Amish Quilt Shop mysteries as Isabella Alan and received an Agatha Award nomination for Maid of Murder. Christy Award winner KATIE GANSHERT is the author of A Broken Kind of Beautiful, three other novels and two novellas. This was my favorite book in the Christiansen series. It really rolls all the books together. I will miss this family. Sometimes it is not good to get to the last brother or sister. This book was about Owen, Scotty, and Casper and Raina. Casper goes out to find Owen to tell him he has a daughter by Raina. Owen is near Alaska working on a crab boat but goes overboard to try and save Scotty. They all end up back home to keep Casper out of jail for killing a man. This had a great amount of romance and some suspense. I loved it. I received this book from Tyndale for a fair and honest opinion. Owen Christiansen has been in a downward spiral since an injury ended his NHL career. But a job on an Alaskan crabbing boat offers a fresh start . . . maybe even a shot at romance with Elise “Scotty” McFlynn, the captain’s daughter.